This is our review of Lee Haney Nutrition 7-Day Detox. This product claims to be perfect for when your body needs a reset or jump-start. It helps you loose weight while also helping to remove bloat. It also is meant to give your metabolism a boost. Continue reading for our full review. Other ingredients include: Organic flaxseed oil, rice flour, gelatin, vegetable magnesium stearate, silicon dioxide, caramel color, and purified water. These ingredients are meant to flush everything out of your system to keep your body running at optimum levels of performance. 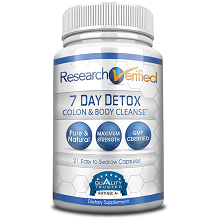 It is an herbal based design that specifically targets your colon, liver, kidney, and urinary system to rid the body of waste and bloat. This product comes with two kind of packets. It is recommended to take 2 packets twice daily. The clear packet should be taken with water, one hour before breakfast and one hour before dinner with a full glass of water. The white packet, should be taken immediately before breakfast with an 8 ounce glass of water and it should also be taken immediately before dinner with a glass of water. Do not exceed the recommended dose. This product is not intended to be taken for more than 7 days. You should wait 4 – 6 weeks before repeating the process. This product contains tree nut so please don’t take it if you have a tree nut allergy. If stool becomes too loose, reduce intake of clear packets to 1 packet per day. If this product is not taken with enough water, it may swell, block your throat or esophagus, and cause chocking. You shouldn’t take this product if you have difficult swallowing. Seek immediate medical attention if you experience chest pain, vomiting, or difficult in swallowing or breathing after taking this product. You not take this if you are pregnant, nursing, or under the age of 18. 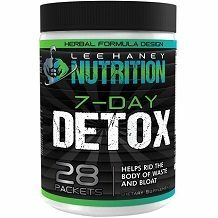 Lee Haney Nutrition 7-Day Detox is sold for $39.99 for a week’s supply. This seems to be on the more expensive side. We were unable to find any customer guarantee on the manufactures website. This causes us to believe that the seller doesn’t have much confidence in the effectiveness of this product. This may also cause the customer to be hesitant. We weren’t able to find more than 2 customer reviews so we can’t speak on its effectiveness. There are a couple of positive things about Lee Haney Nutrition 7-Day Detox. It is made up of all natural herbs and nutrients. The two customer reviews we were able to find were positive and said that this product helped them fight bloat. There were a couple of things that concerned us as well. There is no customer guarantee which doesn’t give us or the customer much confidence in the effectiveness of this product. This is also on more of the expensive side and therefore not being able to get a refund if it doesn’t do its job is a huge no-no for us. We feel that you can find better options elsewhere and do not recommend this product.